Nestling a green setting just above the baya t Porto-Pollo, CASA MURINA is the first Eco Responsible and Cultural Hotel to be built in Corsica. 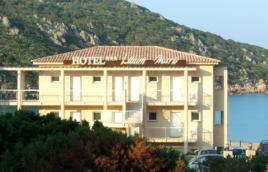 Casa Murina is the first energy saving hotelto be built in Corsica. With its thematic rooms and suites, the cultural and sports stays and activities it proposes, CASA MURINA suggests you in to make discoveries of Corsica of the origins : this beautifull region of Sartenais-Valinco-Taravo which has been mid way between Ajaccio and Bonifacio. Casa Murina Calls to mind of the well built houses which once extended along Corsica coastline in the late 19th century, just as the genovese towers built in the 16th century : for instance the famous tower Capu di Muru, north of Porto-Pollo. It so embodies the collective memory of moor and the colourful perception of the coastline through the ages. Casa Murina reserves you a warm and friendly welcome, services and equipments that feel you at home and free to spend your holidays as you wish. Indeed, the suites provide you with discrete kitchenettes, which allow you eat economically during your stay. On the marina, facing a fine sandy beach. 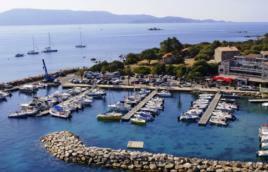 Sunny and modern rooms & suites, with a private terrace and sea view.